The Air Diet Blog - Laura Merrill Godfrey shares her journey through everyday tips for you and your family's Gluten-free, Dairy-free, Healthy, Healing lifestyle! Autism has made life complicated. Autism has redirected our life journey and, well if I’m honest, Autism obliterated my heart, my faith, hope, and all I thought to be true of God, of medicine, of our world. Autism is hard, crushing and dark, but within that, there are moments of light. There are sparks and there are flames and then sometimes, just sometimes there is a break thru that puts a piece of my heart, my soul back together; a light so bright that I feel joy and hope and beauty, real beauty that can only stem from God’s goodness….God’s love and goodness displayed because of others’ passion to work with our son and our family. When our Logan was diagnosed with autism, well, PDD-NOS (now, a “spectrum kid”), we were told to “lock Logan in his room. Tie up his furniture…he is a danger to himself and to others….if you can train a dog with a squirt gun, you can train your son the same….go on dates with your husband, you will most likely get divorced….don’t speak of your son with your spouse on these dates….your son doesn’t feel like us…he won’t love and doesn’t know love…start saving for a place for him…..” All this from the “best” child psychologist in Jacksonville. We started this journey surrounded in darkness, but light has found its way through. Brightness first worked its way into our dark and fear-filled hearts with Dr. Kartzinel and Dr. Buckley and their functional medicine practice and holistic approach helping to restore Logan’s health, body and mind with an appropriate diet and nutritional supplementation….a piece of hope restored. A piece of my heart repaired as our son was embraced and fully accepted by the Jewish Community Alliance for preschool: our non-verbal, autistic boy using sign language joyfully included amongst typical peers! His therapists (Merrill, Amanda, Kim, Matt, Allison, Lisa, Susan) became our family, our friends, our support, our healers for our Logan and our hearts, and aided our family as it grew…pieces my heart restored, hope renewed. Dearest friends of mine from church showed me I was not alone over and over and over again through kind words, prayer, time, acceptance, and love in action…. a bit of faith restored. School teachers at the Keystone Academy ignited hope in me that our son was smart and very capable when taught in a way he could learn. Then came Dr. O and her breakthrough in finding some hidden bacteria, viruses, parasites, and Lyme… a piece of my trust in medicine, healed. More recent, Fun family opportunities provided to us by Dreams Come True has humbled my healing heart as we have been showered in gifts from anonymous people in our community rebuilding my faith in a compassionate world. And now, North Florida School of Special Education… truly the teachers and staff at this school are completing the restoration project…. Of our son, of me. God has used some incredible people to shine light into our darkness over the past 10 years. Pieces of the “Puzzle”… hmmm…perhaps that autism puzzle is not just an image of autism within our son, but also of putting back together the pieces of my heart, mind, faith, ideals, hope… that have been thrown all to hell since our diagnosis in 2007. And as I sit here through the tears, I can see that happening. It is all so very slow, and honestly, painful, as the pieces of this puzzle, my puzzle, must have gotten extremely bent and warped over the years; God working through others is somehow putting back the pieces of my heart, my faith, hope and trust. And, at least in this moment, it feels promising. I have had the privilege of helping to encourage students with special needs to run with the North Florida School Of Special Education running program, under the leadership of a very enthusiastic and inspiring team coach -Mr. Sontag (the school’s music teacher) and kind, steady, supportive co-coach Amy (the school’s culinary teacher). For weeks, I have trained alongside our son Logan running lap after lap on their small track. Each week I cherished that time with him. It was real. He was alive and present and we were sharing in a passion of mine. I was sharing that passion with him. He was embracing it and growing in relationship with me while running, as well as in athleticism. Some days at practice, things felt just, well, so “typical”; I felt just so free and light in spirit as we went 10,20,30,40 laps around this track together in preparation for our big race…I felt happy. I felt hopeful. I felt peace… I felt complete...joy. Race day came last Saturday and I still cannot believe the outcome! Logan, our Logan,- our autistic, anxiety filled, PANDAS inflicted, Lyme Disease infected, OCD burdened, 12 year old son ran the ENTIRE 15K Gate River Run! The whole thing! Ran it! 9.3 miles! And he did it with a quickness, and lightness, and a smile on his face the entire time! I seriously wept as I crossed the finish line behind him, running at my own top pace. His goal was to run 6 miles of the long run (which I thought was pushing it), but he ran it ALL! He passed his goal for himself and mine. He asked to keep running. He wanted to keep pushing forward, and I got to experience that with him. I just cannot express how amazing this experience was. Never did I think I would share this running experience, this passion with him. I used to share my love of running with others’ sons when I coached cross country and track in my pre-mom life…. And now I was training with my own son! And he is amazingly, a natural runner. Talk about hope restored! My heart, my soul, my mind, my little world is being slowly renewed and repaired, because of others…because of God’s love in action created through the encouraging, passionate, and patient people He has placed on our path: like the teachers and therapists he has at North Florida School of Special Education, like Mr. (coach) Sontag; who create opportunity and hope where there once was none. Thanksgiving is most likely leaving you little time or desire to read a long blog, and that is GREAT because I have no time to really write one. However, my children have been reminding me that a "promise is a promise", and well, I promised a friend of mine that I would post my most recent recipe for pumpkin pie that I made on Halloween Night, so with that hanging over my head, here it GOES ..
Pour all the ingredients (minus the pie shells) into a large mixing bowl. Mix them together well with a mixer or whisk. Pour the orange, liquidy-gooey pumpkin mixture into the prepared shells. Allow the batter to go super close to the top of the pie crust rim. Try not to overflow. Bake the pies for 15 minutes at 400'. Reduce the heat to 325 degrees. Bake for 45-50 minutes at this new temperature. If the crust begins to get too brown, loosely cover it with foil. (I did not need to do this with this particular crust.) Remove the pies from the oven once the center doesn't jiggle when lightly shaken. If you are needing to stay away from more allergens than just gluten and dairy, please make my Crustless Pumpkin Pie from The Air Diet cookbook (www.theairdiet.com/store)! It is also quite delicious and will satisfy your pumpkin craving this holiday! For two days, we have experienced “normal”. For two days, my mind has been able to complete a thought because I was not interrupted every 30 seconds. For two days, there have been moments of quiet within our home. For two days, we have smiled and laughed more than we have all week. We joined and easily fit into a new church homegroup with other families. We have been free to be. Free to think. Free to play. Our other two boys are calmer. Our other two boys listen to me and respond to me without intense reaction. The giggles, the smiles … precious. Our stress level is low. Our life is relaxed, almost tranquil; but there is an emptiness, attached with that, a painful, twisted reminder…Logan. Now, that statement in itself makes me feel like a pile of crap. What mom attaches “painful and twisted” to her son? Who does that? Me, an autism mom. Me, a PANDAS mom. Me, a Lyme Disease mom. Me, a Babesia mom. Me, a tired, broken, broke, stressed out, worn out, lonely, sad mom. Me. I do. I love Logan. He is loved by all of us. But it is a HARD love. It is a sacrificial love. It is an often times life-sucking love. I love Logan. But I am broken; and soaked with tears, because these past two days have been a dream, a fairy tale version of the Godfrey family, at which I will wake up from at 6:00 PM, Today! And so, here I am in tears. Not wanting this version of us to end, twisted over it, and also missing our boy. Twisted and broken that God allows the pain, the heart ache, the illnesses, the lack of hope, the lack of healing, the stress to continue. I am broken in trust for doctors, I am broken in trust with relationships, including my relationship with God. More often than not jealousy, anger, and bitterness consume me over what others are blessed with and what our God has allowed to be taken from us. How do I continue to praise my Almighty God. King of Kings. Lord of All. The Almighty Healer … when He doesn’t heal. He doesn’t heal He doesn't heal our son! He doesn't resurrect our family! But I believe He can! And only He can. He can raise the dead! ... surely he can heal our son if He wants to. It is core of my faith! But He continues to not Heal our son. He permits hardship for our family. Building, growing hardship. I always try to recommit to hope. To trust. I want to. I do, but I am broken and guarded. One can only take so much pain. So much disappointment. The grass is greener on the other side of Autism. Typical …. Typical families. Their existence has to be so different then ours. I have nothing to go on except the past 2 days since Logan is our oldest. Atypical is all we know. But this temporary "typical", it was like a fresh breeze on a sunny beach day. Easy. Carefree. And all that is about to change, at 6:00. I want to embrace Logan. I miss him. His brothers miss him. Michael's thoughts have Logan circling them ... We love Logan. I am crazy, sitting here, crying, loving what is our temporary existence, missing what is reality, longing for better, trying to settle and be content with what is, fighting for it all to make sense! I have been called many things, some good, some bad… but crazy about somes it up. I am tired. Twisted with emotion. Broken by the twists, the conflicted heart. The heart that longs to find reason to hope. The heart that surrenders and begs for God’s healing. The heart that aches to be content with His plan. The heart that bleeds for normal. I love Logan. I want so much more for him than this life has to offer. So I will continue to hope ...pray ... endure the crazy I have become. Inspired by the sun and fun of the approaching Labor Day weekend, I had high hopes of creating a scrumptious key lime pie to spark up the holiday eats. I bought all the ingredients I thought I would need, and even scribbled down a potential recipe. Labor day came with lots of beach fun and family time, but I never did get around to making the pie I had promised to my key lime loving husband! So yesterday, I made it my post church project to create a gluten and dairy free key lime pie. I have to admit, I was actually really excited about this! As many of you know, I am not so into baking; in fact, it completely stresses me out. However, life circumstances have dictated that I learn to do it, and well, perhaps I will begin to like it more and more in time. But since key lime pie holds a special place in my heart, I was eager and happy to jump right into this sweet, baking adventure to make a delicious tart pie! I honestly was hoping just to search online and find a recipe that would work, as a week had gone by and I lost my recipe I wrote down, go figure .... but I couldn't find one that seemed right for my taste buds and pantry. So, the educated guessing up a creative recipe began; and it turned out to be a success! I started off by making the crust. There were many healthier versions of crust that I could have made that would have been more Paleo in nature, but the truth is I just wanted a damn good pie; not necessarily a "healthy" pie. I mean come on....IT'S PIE! Got to be sweet. Got to be delicate! Got to be rich. Got to be flavorful. Got to be memorable. So graham cracker crust is the direction I took. Of course, gluten free graham crackers! 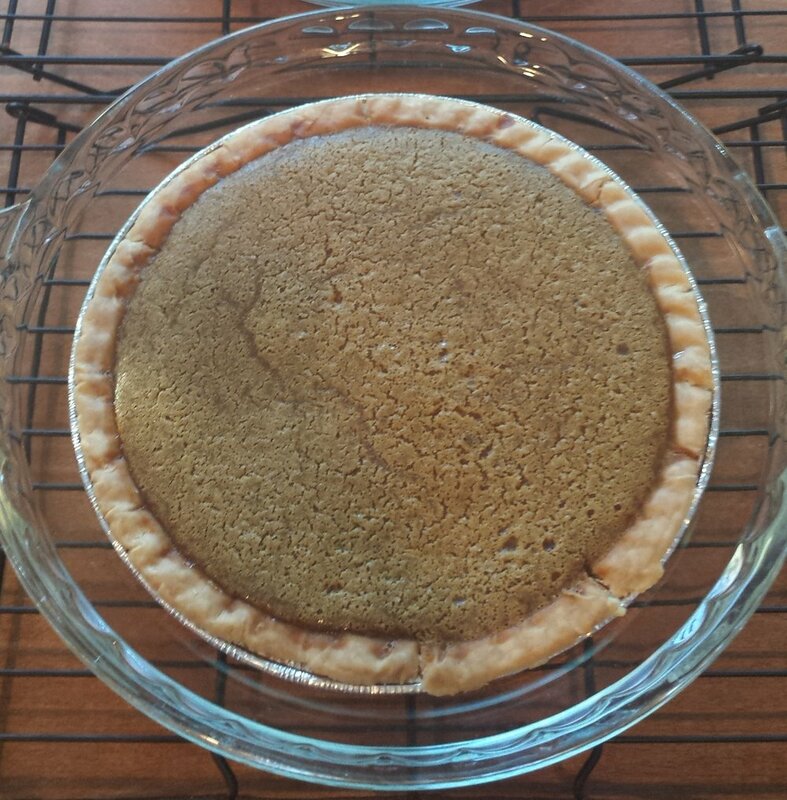 I used a box of Kinnikinnick Graham Crackers to create a perfectly moist, adhering crust. I placed the crackers into the Vitamix and chopped them until they were a fine mix of crumbs. I was aiming to have 2 cups of crumbs, but came up a little short as my oldest had stolen two of the crackers while I was prepping! I added a 1/4 cup of shredded coconut, 1 Tablespoon of organic sugar, as well as a heaping 1/4 cup of Hazelnut Meal to the graham crumbs, and blended them together in a large mixing bowl. Next, I added 6 tablespoons of softened (mostly melted) Earth Balance Dairy Free & Soy Free buttery spread. Once stirred together, I pressed the gooey graham cracker mixture evenly into the bottom and sides of a glass pie plate. So I must confess, I could not at this point decide if I should bake this pie shell or wait until I filled it. In my indecisiveness, I went half in and baked it for only 6-7 minutes at 375'. Now the most important part ... the filling. Eggs make me nervous. I don't like them. I mean, I like what they do, I just don't like how they taste. So, I wasn't sure how many yolks I wanted to throw into this baby. I set myself on 3. Two yolks and one whole egg. Not sure if that is standard, but seriously, there really is nothing standard about a gluten and dairy free key lime pie! I am setting the standard here! So 2 yolks and 1 egg went into another mixing bowl, along with a tad bit shy of a 1/2 cup of key lime juice. (You can squeeze those little limes yourself or buy it already prepared. It all depends on what allergens you are trying to avoid as many products have some sort of preservative/additive in them.) Although I did say I didn't want a "healthy" pie, it's a sliding scale; so I stirred in 1/3 a cup of honey .... and 2 Tablespoons of sugar. Next came the game changer: COCONUT CREAM. Typically a key lime pie has sweetened condensed milk, but obviously this is not a dairy free item. The easiest replacement is a can of coconut cream. I chose to use the can of coconut cream, you can however, use a regular can of coconut milk and separate the cream from the liquid. If you enjoy extra steps ...have at it! I on the other hand rush to the easy when it is available, since so often all the options in my life just seem to be in one category of "HARD". The final two ingredients to be mixed into the filling are tapioca flour (starch) and grated lime zest. The tapioca is necessary to help give the right texture to the pie, so don't skip that step! Two tablespoons need to be mixed into the liquidy-yolk-cream. I just threw the tapioca flour into the liquidy mix, and it made it challenging to mix all the clumps out when I was blending. So, I think it would be worth trying to sprinkle it around evenly while blending. The lime zest ... Ok so once baked, it looked a little odd. But hey, I am creating something novel right? So, maybe it looked perfectly pretty as designed. Your choice on the zest. If you don't throw it into the mix, put it on top of the pie after baking as décor with a zip of bright tartness. The filling was more liquid than I thought it would be even after mixing it all together for quite some time. However, I went with it and poured it over the prepared graham cracker pie shell and baked it at 350' for 15 minutes, then covered it loosely with foil, and continued to bake it for 10 minutes. You will know it is ready when the center is not jiggly! As I anxiously waited for the pie to cool, I ran out the door to pick up some So Delicious dairy free coco whip to add a nice finishing touch to this deliciously smelling hot pie! Whoo.... I was excited about this one. I was considering calling the pie "dinner" instead of our planned cookout, just so I could try it sooner! I returned home from the store with two different whipped toppings ... So Delicious CoCo Whip (like coolwhip) and a canister of Rice Whip (canister of whipped cream). The Rice Whip definitely won on appearance and fun-factor, as for every one shot of rice whip that hit the pie, a few went into our mouths! (The kids had a blast with that!) The So Delicious CoCo Cream won the taste test though. I will need to figure out how to make it look pretty next time around. The first slice cut and lifted out of the pie plate perfectly! AWESOME!!!! My heart was so happy and I had not even tasted it yet!! Logan received the first slice (I stole a bite). The texture and taste were great: soft, creamy, sweet, tart! And the CRUST! The crust receives the shiny medal on this one! Oh my it was excellent. My only sigh was although it was tart, it wasn't snapping at my taste buds with a tart zing. I am not sure if that means put in more lime or take out some sugar. However, my immediate solution was to squeeze a lime on top of the pie. And that was it for me. Keylime heaven! The pie was a hit. I didn't expect my boys to be as excited about it as they were; which is fantastic, but there is no pie left! My oldest son ate 3 pieces (Yes, I let him eat 3 pieces of pie!!) and the first thing he said to me this morning when he woke up was, "Mommy, I really loved that key lime pie! It was soooooo good.". There you have it. 1 can of coconut cream, 5.4 fl oz. Preheat the oven to 375'. 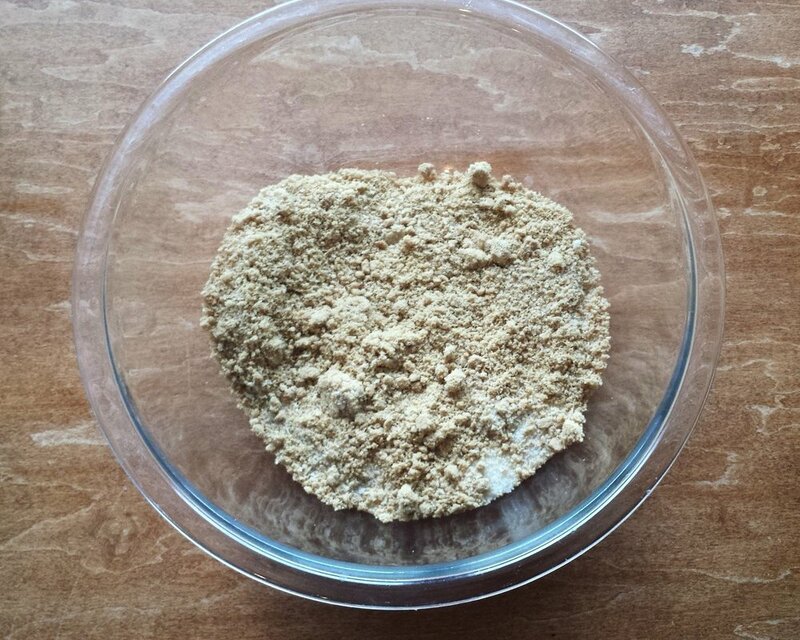 Place an entire box of gluten free graham crackers into a Vitamix or food processor. Pulse or mix until the crackers become fine crumbs. Pour the crumbs into a mixing bowl. Stir in the coconut, hazelnut meal, and sugar, and mix until well blended. Add 6 Tablespoons of softened Earth Balance Dairy Free Soy Free Buttery Spread. Mix together until the graham cracker crumbs are totally moist. Transfer the buttery graham cracker crumb mixture to a glass pie plate. Press the gooey mixture into the bottom of the pie plate evenly, and about two thirds the way up the side. Place the pie crust into the preheated oven and bake for 6-7 minutes. Remove it from the oven, and allow it to cool and settle. Reduce the oven temperature to 350'. Crack 2 eggs and only put the egg yolks into a mixing bowl. Add 1 more entire egg (yolk & white). Beat the eggs together until uniform. Pour in (just a little less than) a 1/2 cup of key lime juice. Add the honey and sugar. Mix for a minute. Pour in the coconut cream and carefully add the tapioca flour a little at a time while you continue to mix the filling. If you desire (and I think you should), toss in the lime zest. Continue to mix until smooth. Pour the filling into the prepared pie shell. Bake on 350' for 15 minutes. Cover loosely with foil, and continue to bake for another 10-15 minutes. Remove the pie from the oven once the middle of the key lime pie is no longer jiggly. Set the pie out on a cooling rack. Once cooled to room temperature, place the pie (covered with plastic wrap) in the refrigerator until chilled. 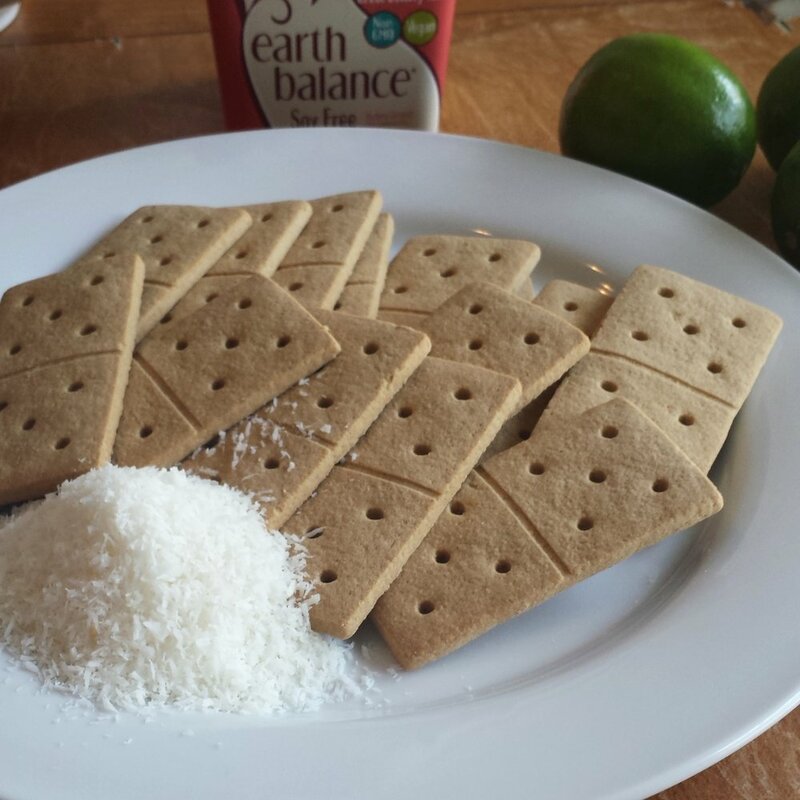 Add a sliver of a fresh lime and dive in! Carrot Cake kind of Birthday! So right off the bat, I am thinking I will not get too many readers on this blog post as most people are frantically trying to pull their diet together after months of indulgence. However, for you foodies who keep it all in balance throughout the year, this post is for you! My husband is one of the many unfortunate people who's birthday falls right around the most festive time of year. The December babies, like my brother, always seem to get a bit gypped in the present department, which really stinks. And sadly, for Michael, by the time January 3rd rolls around, both my husband and I are a bit partied-out and tired, and so rarely does he get the celebration he so deserves! It seems men, for the most part, tend to be simple and easy to please; so when my husband requests a "Carrot Cake" for his birthday celebration, my God, I'm gonna make the best damn cake I can! So that is what I did! No, I did not rob the cradle (If you are counting candles.)! We have hit the age bracket where fewer candles is best as to not set the entire cake ablaze! With age comes wisdom ... heehee (sorry babe)! 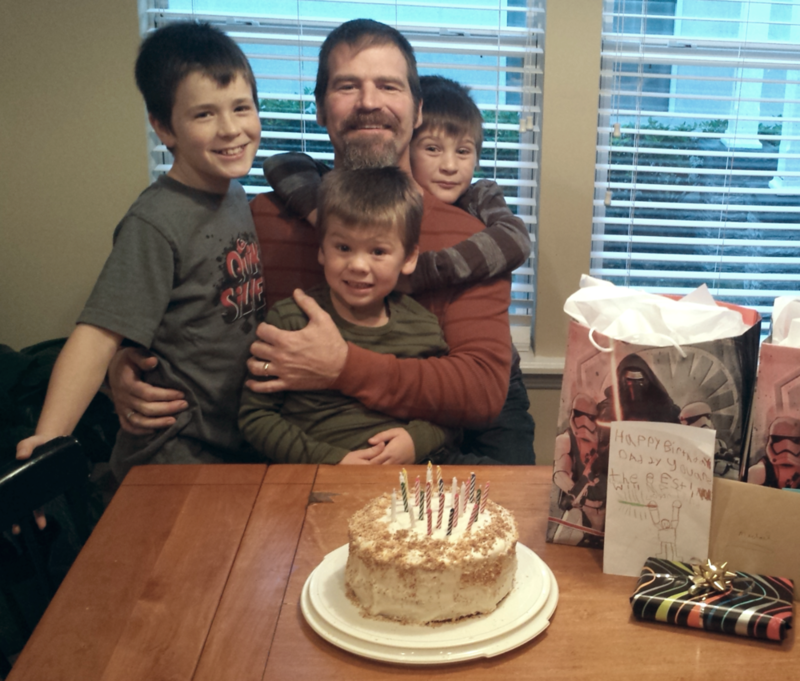 So this Gluten-free, Casein-free (dairy-free) Carrot Cake created lots of smiles around the birthday table. It was moist, rich, and perfectly sweet. And thanks to "Follow Your Heart", we even got to experience the decadent blanket of cream cheese frosting with every bite! (It is dairy-free) I do confess, I cheated a bit by using a pre-mixed bag of flour, but time was of the essence! Actually, I embrace these "cheats" as "victories" as our autistic son Logan is no longer allergic to 35 foods due to following The Air Diet ( www.theairdiet.com/store ). We can now enjoy a bit more freedom with our food choices in our family! Although this cake was awesomely delicious, there are a few changes I will make next time around. I am sharing these with you in hopes of helping you create an irresistible cake! Grease (I used Spectrum Palm Shortening) and flour (you should but I didn't) two 9 inch cake pans. Set aside. In a large bowl, mix together the dry ingredients: GF flour, Hazelnut flour, baking powder, baking soda, salt, cinnamon (and extra spices like nutmeg & cloves/ginger). In another bowl, use an electric mixer to combine the organic sugar, brown sugar, oils, vanilla, and eggs. Carefully mix the dry ingredients into the wet mixture while adding the lemon milk into the batter. Stir in the shredded carrots, pureed carrots (applesauce), coconut flakes, and if desired, chopped pecans. Pour the cake batter into the greased pans. Bake the cake at 350' for 35 minutes. I highly recommend checking the cake after 30 minutes. With some of the ingredient changes, baking time may need to be adjusted. I honestly forgot to set the timer, so this is a guesstamate! It may take longer like 35-40 minutes until the center is fully baked. Check the center of each cake with a toothpick. If it comes out clean, they are ready. Allow the cakes to cool for a few minutes on a cooling rack before turning them over. Make sure you let them completely cool before attempting to frost them! Allow the butter to soften, not melt. Add the cream cheese and mix well until nicely blended. Use an electric mixer to combine the confectioners sugar with the buttery cheese mix. Add the vanilla and milk. Mix until it becomes a creamy, fluffy, white frosting. Frost the top of the bottom layer of cake. Place the top layer on the cake and frost the entire outside, starting with the top flat surface. Smooth the frosting into the desired appearance. Sprinkle the outer circle with toasted coconut and chopped pecans. So if I can't see fall right now, I guess the next best option is to taste fall! So time to bring on the delicious pumpkin! While passengering (as I did not do my share of driving) in the car for hours on our trip, I had the chance to be inspired by many tasty looking pumpkin treats on Pinterest. So, here is my successful attempt to satisfy my fall craving with Pumpkin Muffins! Now that Logan has experienced much healing in his gut over the years due to clean, allergy-free eating in combination with other healthy measures like HBOT, probiotics, antivirals, antifungals, and supplements to combat inflammation, I am now able to bake with eggs and rice flour rather than having to substitute these ingredients. Because of this, I decided to try out Bob's Red Mill 1 to 1 Gluten Free Baking Flour for these bundles of pumpkin goodness, and I am glad I did! Not only did it simplify the recipe, but they tasted fantastic - light, fluffy, but rich. I think they would turn out great using another flour combination (for example, sorghum + garbonzo/fava flour + tapioca starch + potato starch), and I will explore that later. Ready? If you are like me, a busy mom with only a short break of time to really only do one of the following: shower, bake, cook, shop, or do laundry before you have to just wait til tomorrow ... you better move quick!!! Preheat your oven to 375', grab two large mixing bowls, a mixer, a large spoon, a spatula, measuring cups, measuring spoons, muffin liners (I like to use If You Care Baking Cups) and all your ingredients. Measure out all the dry ingredients and place them in a large mixing bowl. (I was a lazy measurer and most of mine were more like "heaping" measurements ... FYI) Use a large wooden spoon to stir all the dry ingredients together until it resembles one flour. In the second bowl use the mixer to blend together the eggs, pumpkin, coconut oil, and vanilla. **I chose to use eggs because I had that freedom, but I am sure this recipe would also be delicious egg free. I have not made this one egg free yet, but if I did, I would use 3 tablespoons of applesauce mixed with 1 teaspoon of baking powder with the addition of 1 1/2 teaspoons of egg replacer combined with 2 tablespoons of water. (see why eggs are just easier?????) Another egg free option would be just to use 1 tablespoon of egg replacer mixed with 1/4 cup of water. Pour the wet ingredients into the dry. Use a spatula to scrape the bowl to ensure nothing needed is left behind! Use the mixer to blend the ingredients until smooth and beautifully orange. Stuff the muffin baking pan with the baking liners and fill them to the top with the pumpkin muffin batter. Sprinkle the top with raw sugar (little bit bigger crystals than regular sugar) and bake for 22 - 24 minutes. You will know they are done when your house smells amazing and cozy, or you can just stick a toothpick in and see if it comes out clean. It may not look like fall in Florida, but at least now with this Pumpkin Muffin, a couple of my senses are satisfied with a taste of this fall season. Post Baking Thoughts - After eating one of these muffins, although seriously perfect as is, I think they could be even more complete with some finely chopped walnuts, pecans, and/or dried cranberries. My entire family is allergic to walnuts, so if you try it and it is good, let me know! Happy eating! Failed Brownie Mess to Amazing Brownie Dump Cake ... A Quick Save! With our family friends coming over for dinner, I wanted to do something sweet to finish off our fun night. My thought, petite-bite-sized brownies! Sounded basic with a little classy upgrade sure to please all ten of us! Due to the many dinner preparations I was trying to cram into the morning, I chose to cheat a bit by using a gluten-free box brownie mix. This was not my usual "go-to" quick baking brand, as Native Sun was out of it (I usually use Bob's Red Mill) and let's just say I will not go this route again! Then the flash of memory ... I remembered seeing that So Delicious Dairy Free had a new Coolwhip-like product that was gluten and dairy free! YES! This mess could be salvaged! So, I squeezed in a trip to Target to buy a bowl that would work for the now amazing dessert I was planning to create! 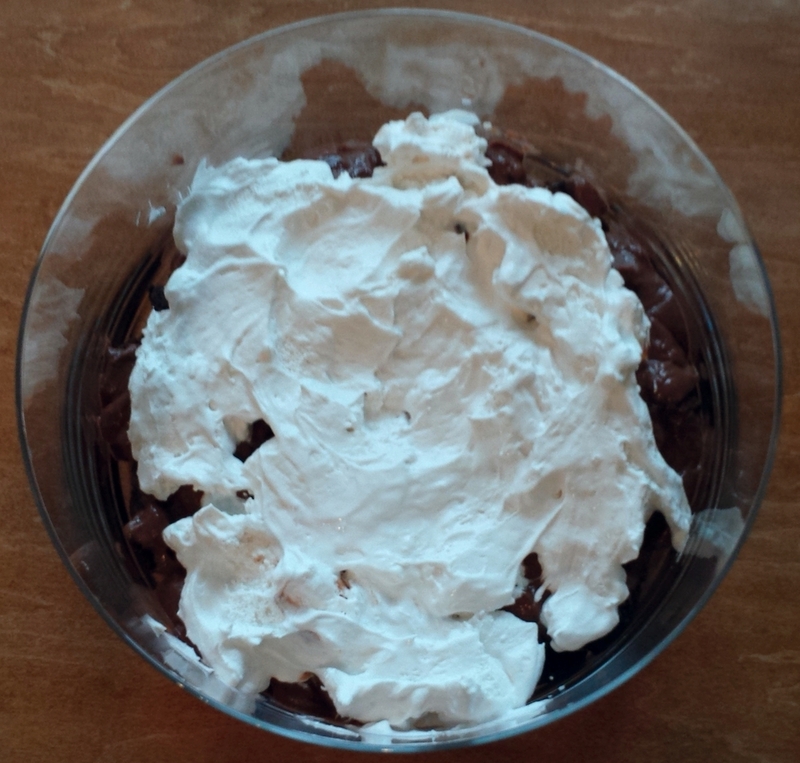 Step 3: Place half of the brownies chunks into the bottom of a trifle or trifle-like bowl. After dropping the kiddos off at school today, I went out for my run. Typically I do this at 5AM, but my usual 4:45 wake up seemed too extreme for this Body Pumped soreness I am still feeling from Monday's class. So with an extra hour of sleep, breakfast, coffee ... by 8:30 it was go time! It was a nice change running in the daylight (feel as though I have become a vampire runner these days), and as I approached my desired turn around point I chose not to turn around: I kept going; tired, hot, alone, I chose to keep pressing on this new route. Something inside of me said to keep running, to move forward ... there is more needed, it can be greater. So what was the greater thing from my run? More calories burned, more sweat, enhanced training effect? I don't know ... perhaps this blog! (heehee) It was a good run though!! Going passed my set turn back point on this run is such the metaphor for my life. Our life with Autism, PANDAS, food sensitivities, leaky gut, microbial invasion, autoimmune disease, MTHFR.... My husband and I so often define a stopping place of treatment for all this, and yet we consistently go beyond that turn around place. We keep moving our son, our family forward. Life is hard with autism. Life is unbearable during a PANDAS flare. Life is often isolating and lonely with food allergies. Life is exhausting when one gives all they have financially, emotionally, physically, spiritually, and still the illness, the autism remains. Yet ... something inside says, "Press on ... Persevere ...Stay the course ... Victory is near". Our journey with our son Logan has taken many different paths. A lot of times it just feels like a circle, but emotions aside ... it is a spiral. It can get mentally messy going around and around with different supplements, therapies, dietary adjustments, and treatment protocols, and it is that frazzled, exhausted state of being that makes me often want to just stop and turn around, turn away from it all. But I don't, we don't. Just like in my morning run, I press on, tired, exhausted, often alone ... I persevere for something greater. In this case ... for greater healing for our son. Autism can bring one to very dark places but also bring some amazing triumphs. Those who rise victoriously from a battle, often look like they have been through hell, they've given their all not knowing the final outcome, but pressing on, persevering with hope for victory. Whether a boxer, football player, soldier, track athlete, cancer patient ... mom of an autistic boy .. it holds true. "PRESS ON and PERSEVERE" ...isn't that what we are ALL CALLED to do?" I think I am feeling driven today to encourage you "WARRIOR MOMS" because we've had a rough few weeks battling a PANDAS flare in our home due to strep throat. As we emerge from this battle from the help of some amazing antibiotics, I am just more aware of our patterns of complete chaos followed by victory and hope so that perhaps that you too will find the strength to "PRESS ON and PERSEVERE" even though you may be worn thin. Victory from the battle must be close. So whatever battle you are facing. What ever point you are at on your journey. PRESS ON and PERSEVERE and "Never, never, never, give up." Extend your turn around point and keep going! When I was young (can't believe I am saying THAT! ), I was the student and athlete that had so many awards and trophies, they almost became more of an expectation rather than an unexpected, exciting achievement. At this stage in my life, that is no longer the case! No one is giving me a trophy for keeping the kids alive and the house in order, restocking clean clothes in the closets, trying to figure out autism, juggling multiple fitness classes, or for assuring the pantry is full and food is on the table! So to receive the Florida Authors and Publishers Association President's Gold Medal Award for The Air Diet came as a HUGE ... UNEXPECTED ... EXHILERATING ... achievement. What an honor it was to be recognized amongst so many talented authors here in Florida for my published Labor of Love! Thanks to my terrific mother-in-law and father-in-law, I was lucky to have a night away in Orlando with my ever-so-supportive husband, Michael, to celebrate--ME! You moms know that doesn't happen all too often...am I right??? Anyways, what a fun night! The banquet was nicely done: a great balance of professional-fancy-fun! The food was tasty and the wine was free! BONUS!! I have no idea how being an "Award Winning" author will impact my journey with The Air Diet, but I hope with the newly added "Shiny Gold Sticker", more people will look to The Air Diet for guidance on their healing journey through Autism Spectrum Disorder, Leaky Gut, IgG Food Sensitivities, Lyme Disease, Celiac Disease, Fibromyalgia, Chronic Inflammation, Fatigue, Weight Issues, and other Autoimmune Diseases that negatively impact the immune system and one's well-being. How do I end this self praising blog????? Hmmm....GO ME! YEAH! So Awesome! Can't believe it! How Cool! And of course, a Big Thank You to Emily Merrill http://www.emilymerrill.com for her beautiful photography; Kristie Feltner http://kristiejoyfeltner.com for her creative graphics & book design, Beth Mansbridgefor her precise editing, and Jane Wood & Frances with Get Book Savvy http://getbooksavvy.com for their mentoring through this publishing process! So thankful to all you for your talents, your commitment, and expertise! Good times ... new smiles ... So honored! A high moment for Me and Jigsaw Living!! Today I am just loving that grill! So thank you my dear Michael for getting one that doesn't make me feel like I'm about to catch fire while lighting it! It's no secret! Eating healthy takes planning and preparation ... but don't let that hold you back. Make it easier on your self to keep your desired commitment to eating clean, nutrient packed food each day by preparing in advance the weeks lunch/dinner. If grabbing a fresh salad with grilled chicken or fish is just as convenient as grabbing a bag of chips ... chances are you will hold fast to your goal of making healthier choices for you and your family. Lunch meals are a struggle for me. My mid day meal seems to get lost in the shuffle of preparing food for my boys and managing all the tasks and events we have set for the day. Often times I find myself eating their left over scraps, grabbing a handful of nuts, or if I'm lucky I squeeze in a protein & green smoothie. What I have found during my times of cleansing is that I feel so much more energized and stable when I have a wholesome lunch. I am a happier, energetic, emotionally stable mom on those days, and well, that is just good for everybody! So with that in mind, this week I chose to set myself up for success! I marinated and grilled five chicken breasts, and prepared a large salad to be enjoyed throughout the next few days. Seriously, we do this often in our household, and not only does it help me out, but my husband is then able to easily prepare a wonderful lunch to bring to work, and my kiddos have healthy options readily available for their meals as well. Here's the thing: when I cook I do not like to measure ingredients. Seriously, it is so much more fun to cook when you are not controlled by a recipe! Be brave ... give it a try. The only down side is if your dish is completely awesome, you may never be able to recreate it! (sigh) That is my husband's biggest complaint. He will take a bite of something and express how delicious it is, and then look at me and say, "You have no idea what you did, do you!" "Uhhh...Nope!". Ok, so welcome to my do it fast and healthy, organic, GMO, allergy-free kitchen!!! I use a large rectangular Rubbermaid container to make and store the week's salad. The base of your salad should be some nutritious mixed greens, focusing more heavily on spinach, kale, and arugula. As far as the other veggies, your call. For me, my salads tend to have some of the following: mixed greens, spinach, arugula, kale, red onion, tomato, carrots, beet sprouts or roasted beets, raisins or cranberries, fresh berries, pumpkin seeds, olives, cucumber, bell peppers, fennel, fresh cilantro or rosemary, and roasted asparagus. I am no grill master, but I am experimenting and learning. Typically my hubby does the grilling, but with this new grill I am trying things out and gaining some confidence in this culinary skill! So my instructions are pretty basic : Light the grill and keep it on high to do some preheating for about 5-8 minutes. Once preheated, turn the temperature down to low-medium and place the chicken breasts on the grill. I got a little distracted while breaking up a serious Lego war between my boys, so my chicken stayed on the grill for probably like 10 minutes or more before flipping, and is a little charred. You typically need only 8 minutes, flip the breasts and grill 7-8 minutes more, or until no longer pink. Every flame is different, so just keep an eye on it. Step 4: Create your Lunch! Fill a plate with your desired amount of salad. Add your chicken, and if you want to kick it up a notch... a sliced avocado. I typically slice the avocado, and top it with some lemon juice, salt, and garlic ... think un-mashed guacamole! Drizzle on some fresh salad dressing (olive oil, lemon juice, vinegar, salt, pepper, garlic, agave/honey). Enjoy! Step 5: Create your Kiddos Lunch! You are modeling a healthy lifestyle, so share your awesome food with your kids! Most certainly your children are not screaming for a salad, but you can use your salad fixins to create a nutritious lunch for them without adding much more work for yourself. Cut the chicken breast into small pieces and stick in a tooth pick. My boys think everything is more enticing with a toothpick! While you are making the salad, cut strips of peppers, carrots, and cucumbers that can easily be picked up with little fingers. Use half of the avocado from your salad to make a quick, basic guacamole-like dip. Just mash the unused half and add a little bit of lemon juice, salt, and garlic. Let them dip their veggies into it. Dipping is fun and with every dip they are ingesting amazing healthy fats to fuel those growing bodies and minds. I hope you enjoy your lunches this week as much as I will! Wishing you health, happiness, and healing ... Laura G.
So what makes these balls so powerful and awesome? Well for starters, it is loaded with tons of protein, fiber, healthy fats, and omegas from the nuts, quinoa, flax, and seeds smashed up in each little ball. To top it off, they are even blessed with Ancient Aztec warrior strength and stamina through the addition of tiny chia seeds. I try my best to fuel my kids with foods that will balance their physical and mental health, and help them grow. As you "Autism Mommies" know, this is not always an easy task; our children can be quite self limiting in their food selections and very resistant to new foods! Having a little power packed ball that easily fits in their hands and can be devoured in a couple bites ... something to smile about! They don't know every cell in their body will be singing praises as they are flooded with essential, healing nutrients ... but you do! Just another trick for your trade. Grab a big mixing bowl and a baking sheet. Preheat the oven to 350'. Start filling the mixing bowl with the ingredients. Use a spoon to mix all the ingredients together until evenly blended. Place bowl into the refrigerator for 10 minutes. Use a spoon to lift just enough of the mixture out to make the desired sized OMeGa Powerball. Roll the extracted mix into a ball until no more mixture remains, and store in an airtight container in the refrigerator. These balls are great for a quick breakfast, treat, or a mid-day boost! I can't believe our 21 day cleanse is almost complete! Seriously, it has been a rewarding experience; so much so, that I am almost a bit saddened at the thought of ending this journey! Not only do I just feel more energized, emotionally stable, and free of belly discomfort, I feel more connected to my husband as we have tackled this challenge together. Week one began with great enthusiasm mixed with a hint of apprehension. For the first couple days, I wasn't feeling like I was starving but was really aware of how many times I wanted to just grab a snack or munch on something I was giving the kids. It was like a thoughtless, automatic impulse to pick up a pinch of food, especially while I was cooking meals for them! I had to keep myself in check. By day three my digestion was in high gear. I felt a little foggy and a bit tired, and had a sore throat. Could have been from the spin class I taught with a bad microphone, or perhaps I was killing off some yeast with the cleanse, or a mix of the two? At this point I was loving that I was sleeping better. Seriously, I am still enjoying good rest... 19 days later, no night sweats, I sleep through the entire night (Unless a lil'bear wakes me up! ), and I wake up feeling alert, refreshed. I was excited and proud of myself for starting off this third day with a fresh juice! It seemed like it was going to be a big deal to have to cut up a ton of vegetables, but it actually did not take very long and I was surprisingly satisfied from this juice, like really satisfied and felt whole and centered. I did feel a bit of a crash before lunch and was really thankful that there was still one piece of salmon and spinach salad in the refrigerator. Oh...and that yummy basil and lemon balm pesto fresh from my garden! Deeeeeelishhhhhh! So, week one was a learning-challenging success! The illness did put a damper on my ability to appreciate some of the positive effects of the cleanse, but there still were some really awesome things happening in the Godfrey household! The kids were very aware that Mommy and Daddy were eating a bit differently, and even though they saw all the kale, beets, cilantro, fennel, ginger, and parsley being used in our meals, they were eager to try all of our nutrient packed juices, shakes, and salads! There was much excitement every morning as they heard the juicer and Vitamix kick on (which is a lot of noise to take in at 6AM!) In fact, it became a bit of a battle for my husband and I as we were protective of our liquid meals they were so relentlessly trying to steal from us! By day four, I just began making an oversized batch of what ever I was mixing up, and served it to my growing boys with a delighted smile! Spring represents rebirth, renewal, a freshness, life, and newness. We all tend to do spring cleaning for our homes this time of year in attempt to match the natural beauty emerging outside. With cleaning in mind, the Godfrey’s are feeling the desire to do an internal clean out… a cleanse. Don’t cringe just yet. Well, Ok…to be honest, I am cringing as I write this because I am now officially accountable to God only knows how many people! But seriously, it is time. The holidays are pretty much behind us, minus a couple far off birthdays and an anniversary, so it is the perfect time to remove the toxic buildup that has gripped hold us since November! I never have been a believer in a quick fix, especially when it comes to diet … and now as a mother of an autistic son, this has been permanently engrained into my belief structure!!! I actually did my first “cleanse” last year in attempt to support my husband who was doing one as a way to support his mom in her attempts to achieve a more pain free existence (just so you know it worked!). I honestly was not happy at all about “being hungry” and “eating subpar food” ---remember, I am a food snob! Looking back, I think that most of my fears were tied to “losing control” and “so many unknowns”. This was just so affirming, and well, a bit easy for us since we live our life on “AIR” (www.theairdiet.com/store). I love the education given by Dr. Alejandro Junger, M.D. in the beginning sections of his book. Not only is it informative, it is incredibly motivating! After reading his book, I was all-in for taking part in the cleanse. Is this an easy thing to take on? No. Is it worth it? Yes. So this is why we are doing it again! I like this cleanse because it is not a quick fix: it is 21 days (actually longer when you count in the preliminary clean out of food irritants). This is long enough though for these health giving behaviors to become habits. Healthy habits … part of your lifestyle. This is a good thing. Well, since I already adhere closely to The Air Diet, and therefore do not need to weed out tons of items from my diet, I have been slowly removing my additional irritants, such as wine (you moms…caregivers know….NO EASY TASK!) and caffeine (tears). I may not be a pleasant person right now (heehee) but there is a better version of me around the corner! This weekend I am going to be doing some serious menu planning and shopping to make the first week go smoothly. It is a bit challenging to get started, but if you can make it through week one YOU WILL DESIRE TO KEEP GOING! The challenges are of course dealing with change of routine, hunger, and the symptoms of detox…you will not feel good as the nasties escape you! I also find preparing separate meals for my kiddos is hard to do when I am not able to grab a bit here and there! It’s a challenge, but it makes me aware of how much of that I actually do during a day. Oh yes, my kids will not be doing this. BUT…. They will benefit from our cleanse, directly and indirectly. Let me tell you, THEY NOTICE what I am doing and WANT to be a part. When the sound of the vitamix revs up, they are very aware that something delicious, creamy, and cold is about to emerge from that pitcher, and they want some! They may not know initially that it is Kale, chia, berries, herbs or some other terrifying vegetable, but they eagerly try it. That is awesome! So sell it! Be excited about it. Let them take part in the tasting and preparations. Not only will you be teaching them healthy dietary practices, you will be filling their little bodies with amazing nutrients every cell in them craves… even if it is only a little: That is LOVE IN ACTION! As parents of children on the spectrum, or even of typical kids, we can be easily exhausted by the demands placed on us every day. But our children need us now and in the years to come. Think of this cleanse as a gift to yourself. You deserve to feel healthy, energetic, and hopeful. By giving yourself this reset, you will most likely have more positivity, energy, and patience, to share with your family, and find more pleasure in your daily living. So join me in this. Start eliminating those irritating foods causing inflammation, disease, and discomfort. The Air Diet – recipes & tips for success in your allergy-free kitchen will provide you with a great framework to begin this cleanse. You will find that because you feel so much better after your cleanse, you will desire to continue your healthy lifestyle for you and your family. The Air Diet cookbook contains many delicious, nutrient packed recipes and encouragement to help you continue that healing, healthy path for you and your family. If you are interested in some guidance or sharing this 21 day journey, comment below or contact me. I can share recipes & tips, and we all can help support each other during the cleanse. Best wishes for happiness, health, and hope! Here is a quick Recipe for Rainbow Juice. The ginger in this juice gives it a nice little zip and is terrific for fighting inflammation, improving circulation, and reducing nausea. Kale and Beets add a boost for the immune system by saturating the juice with antioxidants and essential vitamins and minerals. Although the apples also provide immune support and energy … lets face it, they are in there because they are juicy and taste sweet! Peel the carrots, and trim the ends off of the carrots and celery. Peel the red beet and cut it into four sections. (Be careful, the red stains!) Next, peel the ginger and slice the apples into fours. Place each vegetable into the juicer. And juice! Drink immediately to retain the highest quality of nutrients and enzymes. Holidays, as awesome as they are, can be a stressor for those of us that have loved ones with food sensitivities/allergies; especially the holidays that really revolve around food and candy (hmmmmm....I think that is like ALL of them!) Even if you are not trying to avoid food irritants, all parents can relate to the effect that too much sugar and dyes can have on the kiddos. And if your family is like mine, couple all that with autism, ADHD... there is a reason you'll be toasting with that bottle of wine tonight! So should you just avoid this LOVELY day altogether. NO way! You can still share in the sweet celebration, share your love, avoid food intolerances and GMOs, and maintain the sanity in your household. This was my quick solution for this day of LOVE! I said this was quick, right? So, not totally from scratch but totally in line with our food allergy profile. No Gluten, no Casein, no GMOs, no dyes... you get the idea. After a few hours of cooling, the fun begins! Grab your kiddos and a couple heart shaped cookie cutters, and start sharing the joy of Valentine's day ... fun family time, love, and CHOCOLATE! Had I not been trying to be super quick, I think outlining these chocolate heart brownies with some vanilla icing would have been a fabulous touch. Yesterday our son had one diagnosis, one label; today because of updated expanded tests, he has 5 with some subdivisions! Five categories to classify and describe my son. Amazing how a 23 page document can instantly leave one feeling so deflated. I feel deflated. This document I hold classifying, describing, and supporting multiple labels for my son. You autism moms…you know the deal. That moment after listening for hours attentively to every detail the doctor utters about your child…it all crashes in. The fact that you are actually holding a document of “scientific data” on your child, painful enough!! But then what it says….what it means for now, for the future. As I describe in the Our Story section of the Air Diet www.theairdiet.com/store …the rug has once again been pulled out from under me and I sit here alone in my ache and worries. How one sweet boy could rank so low compared to others his age is hard to soak in ...because he’s our boy. The truth is autism is hard. The truth is that autism exposes all your child’s and your own insecurities, mental and physical deficits, fears, genetic weaknesses, emotional flaws, and doubts to the world. But the truth is it also reveals your strengths and pulls out of you, as a parent, qualities you may never have shown otherwise. It also demands that you live in the moment and treasure what is good, what is right, what is real, what is important. You have to find that silver lining! Logan may not have measured up highly compared to the majority of the population on some standardized tests; however, our Logan, our autistic Logan is sweet to everyone; works hard and wants to do his best; he plays on a basketball team with typical teammates his own age; is learning to play the piano; does his own laundry; helps with household chores; loves babies and is gentle with them; helps me cook and bake; understands the importance of a healthy organic diet; enjoys shopping for and learning about fruits and vegetables; cares for his pet bunny; plays with and looks out for his younger brothers; and is the first to say to me “I love you” each morning. That’s the truth. Perhaps these are not standard, measureable gains…but I am choosing to listen to “The Voice of Truth”. So yesterday was better than today. In fact, I was all pumped ready to blog about my wonderful shopping experience with my kiddos, and now, deflated I just have to. I have to for me, to hold onto what is true and good. I have to for Logan. I have to for you, for hope. I headed out with my crew of three after church to do our weekly shopping with the additional extras for our Super Bowl Super Feast! Now, any mom can relate…shopping with a long list and three energetic, hungry boys is not a task taken lightly. I was prepared. Like any good mom of an autistic child, I had my kiddos’ reward charts ready for that positive reinforcement ensuring a successful outing...in addition, I made sure the quiet threats whispered about losing their lunch out and much desired treat at Native Sun were clearly understood! – sorry ABA therapists, but got to balance things out! As the glass doors of the health food store slide open, it feels like walking into a potential war zone. I brace myself, take a deep breath, pop a couple chewable L-theanine to prevent unavoidable stress overload, and enter. Logan quickly goes into his excited search for every possible organic fruit or vegetable he can find…we are in a completely organic food market…you get the picture! Feeling the sudden surge of adrenaline, I remind myself to stay cool and calmly redirect my Logan and rally in my wandering other two sons. The L-theanine must have kicked in because I had that moment of pure sweet pleasure in which I felt so proud of my son as he began to describe all the organic vegetables and explain to me how bad and gross GMOs were for people. The health educator in me was beaming with pride from her valued student’s intelligence and passion. Certainly it was not like we were floating peacefully and effortlessly through the store….there was redirecting, lifting up arguing kids from under the cart, running over my child with the cart, and periodically removing foreign foods from the cart, but four times…,..FOUR times I was complemented on how well behaved my children were in the store, and praised by how aware they were about healthy food choices. Arm in the freezer, I was humbled, caught off guard. Then I felt a tug to seize the moment to advertise “thank you so much, I actually have a book I wrote full of nutritious recipes right over there on the counter,” but instead, I paused, let the compliment sink in. And it FELT GOOD. I was doing something right. I was doing and have been doing something right for my kids and it shows. Not just to me, my husband, friends, and family. It is visible to everyone. All I could say with a proud, affirmed smile was, “Thank you”. There were quite a few times during the beginning of our journey of healing autism that comments made from others had left me in tears not smiles as they pointed out my son’s differences, difficulties, or my failed attempts at parenting. Those kind people, especially the lovely woman taking the time to say something nice, just because she noticed... a moment I will remember. Remember and feel affirmed that I am doing something right even though there are still often many things that leave me feeling otherwise. Today doesn’t change yesterday and tomorrow can be better! And that there is the truth. I know that is the truth. As we continue to fuel our son(s) with nutritious, organic foods, and reduce their exposure to environmental toxins and food allergens/sensitivities, their health improves. Symptoms of autism are reduced. It has been 8 years of adherence to the Air Diet and over that time we have experienced unforeseen progress in social, mental, emotional, and physical development within our son. As our son’s diet has improved by eliminating gluten, casein, soy, dyes, and other food allergens and replacing all that was disrupting his body and mind with allergen-free, organic foods, and supplements, his gut is slowly healing from pathogens, the inflammatory responses to foods are reduced, and toxins are being cleared from his body. He is healing. There is no cure for autism. I am aware! There is no magic pill. However, providing your children (and yourself!) with healthy foods and reducing environmental toxins…it makes a world of difference. It’s the difference between your autistic child being in “their” world or “yours”. Using food for healing creates a foundation for social, emotional, mental, and physical growth. Maybe it doesn’t present itself on every standardized test, but it shows up in ways that count. Start your healing journey. Start the Air Diet. Time for it to Go! With Christmas in full effect and the daily craze of school and work upon us, Thanksgiving, in my mind, feels a bit far away; however, my refrigerator tells a different story. Even though my husband has eaten Thanksgiving for breakfast and lunch for the last 5 days, much turkey remains and frankly, I am just tired of looking at it! It is time for it to go...but not to the trash! I cringe at the thought of throwing out food since in our home, food costs ALOT! I remember when my brother found out that we were getting a Whole Foods in Jacksonville; he informed me, "You know what we say in Tennessee....Whole Foods-Whole Paycheck!" That's no joke! Eating organic, whole foods free of GMOs, pesticides, allergens, and other mysterious ingredients is not cheap. It can be a very expensive lifestyle...but one with worthwhile benefits for your present health and future! So...what to do? In the Godfrey house of organized chaos, there is a predictable constant: random vegetables with no particular planned purpose means one of two things.....STIR FRY or SOUP! So the hunt began...the obvious first was the container of turkey pieces and parts; definitely I was using that in my dinner creation. I found a lonely parsnip and a couple potatoes that didn't make it into the roasted root vegetable dish. Then there were mushrooms, carrots, celery, and herbs I obviously purchased way too much of in hopeful anticipation of having extra guests to join us in giving thanks. Oh, and thanks to my son's most recent perseveration of alphabetizing fruits and vegetables....we have a couple leeks, as he has become fascinated with this wild looking veggie. OK .... no question about it .... soup it is! Thing is I have never made turkey soup before. I don't know why, because it sounds like a good, tasty thing to do. And guess what...it is, at least this one is, way beyond good. In fact, for my kids - It was bottom of the bowl drinking fabulous! Ahh...look how beautiful all these random veggies are together! Ok, I accept the fact that I may be tad weird...but fresh veggies, these veggies...they make me smile. So I got out my biggest pot (I have learned that when I make soup, it grows and grows until perfection is achieved!) and began chopping. Now the fun begins. Heat (med-high setting) 3 tablespoons of avocado oil in the large pot. Add all of the chopped veggies into the heated oil. Use a wooden spoon to stir the veggies around making sure the oil is evenly spread amongst them. Sprinkle on 1 ½ - 2 teaspoons of sea salt, ½ - 1 teaspoon of black pepper, and ¼ teaspoon of garlic powder. Continue to stir. Wash and then coarsely chop 2 sprigs of fresh rosemary (just the green leaves). Add it to the sautéing veggies. Continue sautéing for 10-12 minutes. Pour in 12 cups of organic free range, gluten free chicken broth. (Now, had I had room in my refrigerator, I would have saved the turkey carcass and made BONE BROTH! If you did save it, get busy making that nutritious turkey broth and have it ready before starting this recipe!) Add 3 whole sprigs of thyme (this means woody stem and all leaves in the bunch). Throw in 2 bay leaves and 2 cups of diced turkey meat. Bring the pot to a boil for 10 minutes and then reduce the temperature to med-low. Cover. Now wait and savor the smell of your glorious soup! At this point the soup looked good but a little incomplete. I felt it needed something dark green. Sighing that I used all my kale at lunch in my smoothie...I had a thought...a smile...grabbed my scissors and headed to the back yard to cut some COLLARD GREENS! After 20 -30 minutes of soup simmering, I threw in about 5 ripped up collard leaves with the stems removed. You could use Swiss chard or kale, and I think it would still taste fantastic. Be patient and give the flavors time to merge and evolve. Now, walk outside. Seriously, do it. Take a few deep breaths. Open the door and walk back in. Breathe in nice and slow....as you inhaled, did your lips curl into a smile? If they did, you worked some magic and that pot will be scrumptious. Give a little taste test. I did at this point, and although it was really tasty and would please the pickiest of eaters, I felt it was still missing something. I opened the refrigerator hoping to be inspired, and there it was: the container of left-over gravy. Into the pot it went, and the most amazing transformation happened. It was as if all the warmth and joy and love of Thanksgiving reappeared on my taste buds. Yes ... this was the secret ingredient. I added about ¼ cup of water to the pot and tossed on a tiny bit more salt, pepper, and garlic...to taste. At this point cover the pot and turn the temperature to low until you are ready to eat. Start putting together some yummy rolls or biscuits and enjoy your savory soup! Freeze the remaining soup, as you made a ton, and treat yourself to this delicious, nutrient-packed meal on a another cold night. "Fast" food without the "mommy-guilt"
With all the hustle of the holidays, it seems eating “easy to grab food” becomes the need and acceptable norm. Although grab-n-go food does allow for more time to SHOP and WRAP and DECORATE and PLAN, it tends to leave you without the lasting energy and nutrients to really fuel you for a happy holiday season, and can leave your kiddos an irritable, whiny, hyper mess more prone to illness…and we all know how that can bust a holiday. Because my oldest, autistic son has had anywhere up to 35 IgG food allergies for the last 8 years, drive-thrus and frozen meals have not been an option for us. Some of that is changing though as more and more gluten-free, allergy-free foods are becoming available in stores and restaurants in combination with his incredible reduction in his number of food sensitivities. However, my experience in restaurants has been one that often leaves my kiddos with dark circles under their eyes, stomach pains, digestive upset, irritability, and headaches ... enough to still make me shy away from the “easy way” out of the kitchen. So, what to do when you can’t go through the drive-thru but still need food fast? You make that fast food in your kitchen. Today in my kitchen, that’s exactly what I did. Upon hearing the boys’ shouts of what could only be explained as shear starvation, my first impulse was to look in the refrigerator for a frozen pizza for their lunch. (I need a break…What??? I still haven’t cleaned the breakfast dishes from the pumpkin pancakes, and there is laundry, decorating, and Christmas cards!) Then, I felt that tug…yes the tug of guilt, or perhaps it’s smarts…but I chose not to open that freezer. Instead, I quickly prepared a nutrient dense dish that in all honesty took less time than it would have ever taken to cook that pizza! What’s so special about this dish? Well for starters…It tastes DeeeLISH! It has the same creamy comfort of homemade macaroni-n-cheese but without the dreaded casein (dairy protein) and well, it has so much more flavor! The bonus benefit…no mommy guilt. OK, so you may not be a pro in the kitchen, but seriously you can just throw this all together with confidence…even if all you know how to do is boil water! So, start with a pot full of water and bring it to a boil. Then add your quinoa pasta (you could also use lentil pasta and feel just as good about the nutrients). After 5 minutes, throw in some organic (fresh or frozen) broccoli florets. Lower temperature just enough so it all doesn’t ooze over the top of the pot. Keep cooking for another 6-7 minutes or until veggies are done to your liking. Drain and then put pasta back into the pot. Add one can of organic coconut milk. Stir on med-low heat. Add in yellow curry powder, garlic powder, and sea salt to taste. EAT! Hope your Holiday Season kicks off with a healthy start! If you are in need of more quick allergy-free food options for you and your kiddos, check out this chapter in the Air Diet! From Farm to Table...not such a far distance! So since you are reading this, I know you have some interest in eating “healthy” or being “healthier”. Seems however to be a challenging thing to be, as what is considered “healthy” seems to change like the seasons. Truth is though…the most nutritional foods have not changed: if it came from the earth and not a factory or through a window, well, it is probably pretty “healthy”. This simple health equation can take on a twist though when food allergies, IgG food sensitivities, leaky gut, and other genetic or autoimmune factors are present. As for my family…we are TWISTED! When we began our “life on air” 7 ½ years ago, we were focused on eating gluten free and casein free. Very quickly we modified it even more by eliminating the allergens from severe food sensitivities (IgG food allergies…and there were many, 35 foods!!). Then came the cleaner side of things…going organic; but that is no longer enough!! Now there is the added dimension on top of all that of avoiding GMOs. Oh, and don’t forget to eat “in season”. And the most current health trend: Farm to Table! In my free time (haha, what’s that? ), I really enjoy being outdoors, working hard, feeling the warmth of the sun, and breaking a sweat…pair that with my love of fresh food (snobbery), and creating my own garden seems to be a fantastic idea! In my “pre-mommy” days…before I was terrified of (aware of) the negative health implications of fertilizers and pesticides…I had an amazing garden! Tons of tomatoes and so many varieties of hot peppers that almost everything we ate was “kicked up” a notch. I had zucchini the size of my cat and gorgeous bell peppers. Now, with all my wonderful knowledge of organic living, to my surprise, my garden, well… it has not been so plentiful (I have an ever increasing appreciation for organic farmers!). That being said, I do have hope this fall all that will change! This is my first fall garden! Everything looks so fresh, “alive”, and radiating promise of a great harvest! SO… what fresh vegetables are growing here? Cauliflower, Collards, Kale, Romaine Lettuce, Salad mixer (varieties of lettuce), Basil, Mint, Oregano, Thyme, Cilantro, and Sage. I love my garden! Something is just so right and peaceful about it; just being around it emanates a feeling of calm and connectedness throughout me. On top of all those feel good feelings… it is a great activity for our family. The kids got really excited to select what we would grow this fall. (Yes, my kids get excited about cauliflower! Live on the “Air Diet” and yours will too!) And my super awesome husband rigged it with an irrigation system sure to keep things growing… seriously that was not on his “honey-do list”. Now it’s time to wait for our first harvest and get some recipes together that will showcase our yummy project! What am I drooling about? 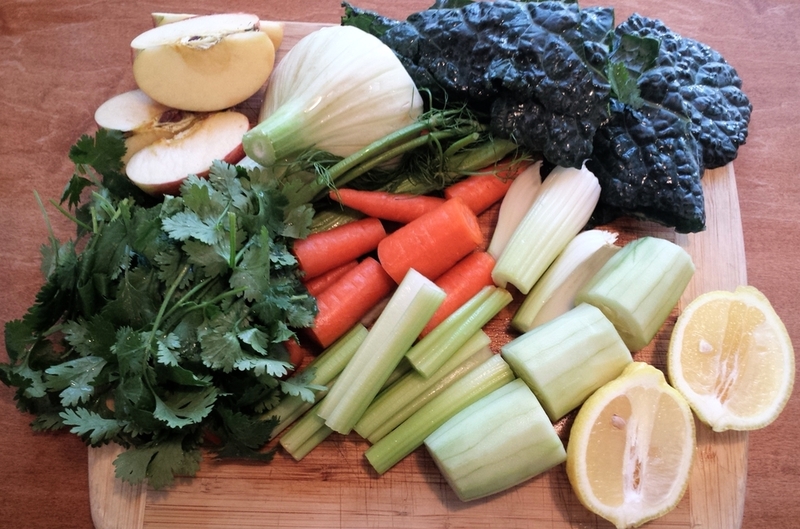 Cauliflower Kale Soup, Collard Wraps, Garlic Collard Greens, Super Stew, Kale Smoothies, and Fresh Juice. Oh, and salad….amazing salads! (Seriously, I am smiling with anticipation and excitement!) If it sounds good to you, keep checking in to see what recipes I share! So easy and so simple to eat “healthy” as well as gluten free, casein free, organic, NON GMO, and in season, when the farm is in your back yard! Check off all those boxes…and check out how revived you and your family will feel as you fuel it with all that it needs for healing and healthy living. So here is my first Pre-Harvest, Gluten Free, Casein Free, Organic, NON GMO, in Season, Farm to Table Recipe Give Away…. Enjoy! I love this soup on a cool fall night, and to my surprise my children do also! I am excited to try it when made with cauliflower and kale from our own garden! Place the cauliflower pieces in a large bowl. Pour the coconut oil over the cauliflower and toss until evenly coated. In a large pot, melt 2 tablespoons of organic virgin coconut oil. Add the diced onion, chopped carrot, and rosemary. Sauté for about 8-10 minutes over medium-high heat. Season with salt and pepper to taste. Add 7 cups of organic chicken broth to the pot and bring to a rolling boil for 5 minutes. Reduce temperature to low. Add kale leaves and freshly diced cayenne pepper. Cover and continue to heat for 5-8 minutes. Add most of the roasted cauliflower to the broth mixture (reserve about 1/3 of the cauliflower). Turn off the heat and allow the soup to cool slightly. Using a ladle, scoop out portions of the soup and place it into a blender. Blend the cauliflower-kale-broth mixture until well combined. Continue this process until the entire pot of soup is a smooth texture. It will appear light green with green specs. Add the remaining cauliflower to the pot of soup. Add salt and pepper to taste, if needed. You may even enjoy a few more fresh kale leaves tossed into the mix. The kale will soften as the soup continues to heat. Continue to warm the soup on a semi-low heat, and serve alone or with a mixed greens salad and toasted bread.